Many builders use roof trusses to frame a new roof, but in most cases, there is nothing wrong with using rafters. 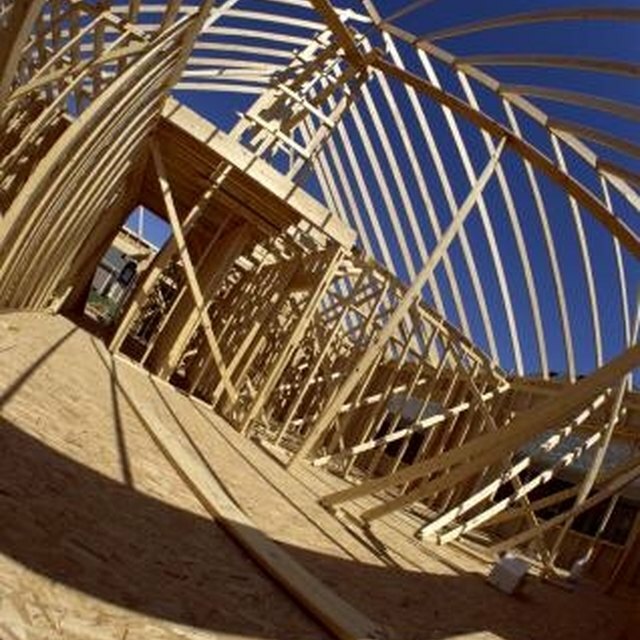 Roof trusses install faster and easier, but are more expensive. The layout and cutting of roof rafters requires knowing the rafter length and roof pitch -- figures the architect normally provides in the blueprints. Laying out and cutting the rafters includes the cut at the ridge rafter, the birds-mouth cut at the exterior wall, and the second plumb cut at the bottom end of the rafter. Builders lay out and cut roof rafters at the building site for roof framing. Hold an uncut rafter board so the faces are vertical and you can look along the edge. The edge will have a slight bow in it, either up or down. Turn the rafter board so the bow rises in the center of the board. This is the crown, and the crown is always up on a rafter. Mark the edge that is the crown. Lay the rafter across the sawhorses so the crown faces away from you. The peak end of the rafter is on your right, and the roof overhang end is on your left. Lay the framing square on the rafter near the end with the corner facing you and the short leg on your right. Move the short leg of the square so the number on the short leg that corresponds to the first number in the roof pitch aligns with the front edge of the board. Adjust the long leg of the square so the second number of the roof pitch is aligned with the front edge of the board. Draw a line along the short leg of the framing square to mark the cut at the peak of the roof For example, the 8-inch mark on the short leg and the 12-inch mark on the long leg both align with the front edge of the rafter board on an 8 in 12 pitch roof. Remove the framing square and cut the end of the rafter off with the circular saw. Hook the tape measure on the cut end of the rafter along the crown edge. Measure the length of the rafter and mark it at the bottom end, and at the building line. The building line is the outer edge of the exterior wall framing. Place the square on the rafter to mark the angle cut at the bottom the same as at the peak. Draw the cut line along the short leg. Slide the square up the rafter to the building line, set the pitch and draw the line. Turn the square over so the corner faces away from you and the long leg is on your right. Align the short leg with the building line. Align the number that corresponds to the exterior wall top plate width on the long leg with the bottom edge of the rafter. Mark the line along the long leg. Place an "X" inside the resulting triangle. Cut the bottom end of the rafter off with the circular saw. Cut along each line of the triangle beginning at the bottom edge until the leading edge of the blade reaches the intersecting line. Complete the cut with a hand saw to avoid over-cutting the rafter birds-mouth. Test fit the rafter to ensure it fits correctly. Use the first rafter as a template to lay out and cut all the rafters for the remainder of the roof. The building line position is easy to calculate. Divide the width of the exterior framing by 2 and subtract 3/4 inch. Square the result and add it to the square of the height of the top of the ridge rafter above the exterior framing. Take the square root and the result is the building line position. Some carpenters will complete the birds-mouth cut with the circular saw. This overcuts the line and weakens the rafter. Some building inspectors will fail a roof with overcut birds-mouths. Finish the cut with a hand saw.